This is the script from my Friday Feehery Theory on the Potus Channel on XM/Sirius radio. Please be sure to tune it. Marbury vs. MadisonI’m John Feehery. Earlier this week, President Obama claimed that should the Supreme Court rule his prized health care law unconstitutional, it would be unprecedented. I am no lawyer and I don’t even play one on television, but I thought the whole point of the Supreme Court was to act as a referee on what is constitutional and what is not. This all started in earliest days of the Republican, in a political spat between supporters of John Adams and Thomas Jefferson. William Marbury was supposed to get the lucrative post of Justice of the Peace in the District of Columbia. Marbury was a close friend of then President John Adams. 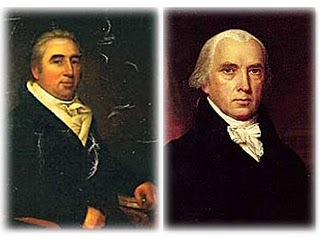 But Marbury didn’t get his commission because James Madison, a close friend of Thomas Jefferson, refused to give it to him. John Marshall, a cousin and fierce rival of Mr. Jefferson, called the whole process unconstitutional in his new position as Chief Justice of the Supreme Court, and from that day forward, the High Court had the last word on the Constitutionality of laws. Of course, Mr. Obama knows all of this, because he taught Constitutional law at the University of Chicago. And it should come as no surprise to the President that politics may play a role in how Roberts Court decides the constitutionality of Obamacare. After all, politics played a huge role in Marbury vs. Madison, the most important case of judicial review in our nation’s development. The question I have is simple: If Mr. Obama knows his Constitutional history, why is he prematurely complaining about a Supreme Court decision that hasn’t even been made yet?